UPDATE: THE GIVEAWAY HAS CLOSED! This blog post is part of the Hanukkah Blog Party, where kosher bakers from all around the world share their Hanukkah themed recipes with each other and everyone else! Scroll down to the bottom of the post for more information, links to other blogs, and instructions on how to enter to win a free cookbook! You can join in the party by tweeting about the posts you read and using the hashtag #HanukkahBP. Chanukah is probably my favorite holiday in the Jewish calendar. Sure, you get a lot of presents, which is always nice. But more importantly, it's traditional to eat a lot of fried foods to commemorate the oil that burned for eight nights in the Temple in Jerusalem. That means there's always tons of latkes and doughnuts at Chanukah parties, both of which I love to eat. In fact, when I lived in Israel for a year, I ate about 20 jelly doughnuts in a week. Tip: Don't do that. It's a super bad idea. Anyway, latkes or doughnuts are ideal candidates for a Chanukah blog post. You've got your fried dough, your sugar, and did I mention the tasty fried dough? There's only one problem: I really hate frying. No, seriously. I've never enjoyed frying. Well, except that time over Thanksgiving where I deep fried a turkey, but that's a different story. It's a messy process, potentially quite dangerous, very easy to screw up, and the oil gets in the air and messes up my eyes. There also may be some residual trauma from when I stood over a deep fryer for four hours every Saturday night in my underground college restaurant (I really need to write about that at some point.) As a general rule, I try to avoid frying at all costs. So when I thought about what to make for my Chanukah post, I decided to find another way to incorporate oil into my baking. I Googled around for some options, pulled out all my cookbooks, and finally stumbled across a cake that uses olive oil and orange juice. Sold! I love it when a cake comes together. This is an awesome cake. It takes about 15 minutes to put together, with the bulk of the work spent zesting an orange. Otherwise, you can do it all in two bowls, and the second bowl is just to sift the dry ingredients together, so that doesn't really count. And in return, you get a cake with just the right amount of orange flavor without being too sweet. Plus, it's completely dairy free, so it can be served all year round! Let me take a moment to talk about olive oil. Odds are, you've got a great bottle of extra virgin olive oil in your pantry. Please, if you can, don't use it for this cake. The quality of the cake won't be diminished, but your high-quality olive oil will go to waste. Extra virgin olive oil usually has a light and delicate flavor which can get overpowered by the taste of orange. Unless your extra virgin olive oil has a really powerful olive taste, use a cheaper olive oil. Save the good stuff for when it can really shine, like in a salad dressing. One last side note: I originally had a section here decrying the use of extra virgin olive oil in baking because the heat would break down the flavor compounds. I did some research into it and could not find a single source to back up that theory. While it is true that unrefined extra virgin olive oil has a lower smoke point than most oils (250 degrees Fahrenheit compared to the 400+ of corn oil), the interior of the cake is unlikely to exceed 200 degrees, so no degradation should occur. Myth dispelled! Anyway, back to the subject at hand: The cake. Originally, I thought it came out a tad drier than I would have liked. But in an unscientific survey I conducted where I gave people cake and asked them if it was dry, no one agreed with me. Still, if you make this at home and decide it's dried out, I'd recommend increasing the oil not the orange juice. I think the flavor balance is just right, and it can always take a bit more oil. Orange juice, on the other hand, is pretty strong. Don't go overboard. One final note: making this cake is part of a larger project I'm undertaking where I'm examining how different oils can be used in baking. Over the next month or so, I'm going to be trying out other baked goods made with olive oil, along with coconut oil and vegetable oil. 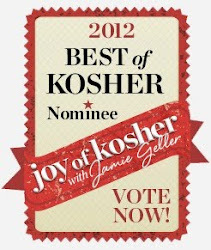 If you've got recipes that you'd like me to experiment with, send them to me or mention it in your contest entry below. Seriously, doesn't that look delicious? Sift together the flour, baking powder, baking soda and salt in a medium bowl. Set aside. Mix together the sugar and eggs in another medium bowl with a hand mixer on medium speed until blended and light. Drizzle in the olive oil and vanilla and mix until light and smooth. Add the orange juice and zest and mix well. Add the flour mixture half at a time to the wet ingredients and mix on low just to incorporate. Pour into the prepared cake pan and bake for 15-20 minutes. It's done when a skewer inserted in the middle comes out clean. It may take longer than 20 minutes to bake, but should take no longer than 25. Let the cake cool 15 minutes, dust with confectioners' sugar (if using) and serve. 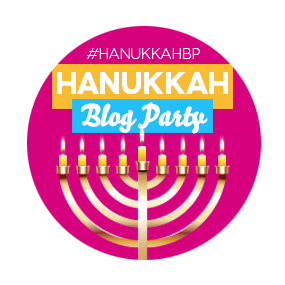 Welcome to our first ever Hanukkah Blog Party, hosted by Leah of Cook Kosher and Miriam of Overtime Cook. It's traditional on Hanukkah to eat fried treats, most notably donuts and latkes, and we've got a fabulous array of Hanukkah themed recipes, treats and crafts from Jewish bloggers all over the world! Scroll down for links to all of the delicious treats. How to enter: Leave a comment on this post saying how you like to use olive oil when making food. For example: salad dressing, butter replacement when baking, frying medium, etc. Your entry must be accompanied by a valid e-mail address to qualify. If you don't want to type out your e-mail address publicly, send me an e-mail at abonetopick@gmail.com with the subject "Hanukkah Blog Party Contest Entry" and a link to your comment (you can get your comment's unique link from the timestamp next to your name). Giveaway ends at 11:59 PM on Sunday, December 16th. Limit one entry per person per blog, so visit the other blogs for extra chances to win! Prizes can only be shipped within the US. Remember: entries must be accompanied by a valid email address in order to qualify. Do you have a recipe you think I'd like to make? Send it to me at abonetopick@gmail.com. I love to try out many different types of desserts and methodologies, so bring it on. I'll accept non-dessert recipes too. A guy's gotta eat regular meals, too, you know.